We know from Apicius that Ancient Roman cooks prepared shredded cabbage dressed with vinegar, eggs and spices. Food historians generally agree the term "cole slaw" is of Dutch origin, implying perhaps that the true progenitor of modern coleslaw is most likely a Medieval creation with Roman roots. Mayonnaise is an 18th century invention, meaning the recipe (as we know it today) is only about 200 years old. Coleslaw means literally ''cabbage salad''. English borrowed and adapted the word from Dutch koolsla at the end of the eighteenth century, probably from Dutch settlers in the USA, and the first printed example of it shows its outlandishness tamed to cold slaw--a folk-etymological modification often repeated in later years. English does however have its own equivalent to Dutch kool, 'cabbage', namely cole. Like kool, this comes ultimately from Latin caulis, ''cabbage'', whose underlying etymological meaning is hollow stem. An A to Z or Food and Drink, John Ayto [Oxford University Press:Oxford] 2002 (p. 85). Coleslaw. Also, "cabbage salad," Shredded cabbage, mayonnaise, and seasonings, usually served cold as a side dish. The words are from Dutch koolsla, a combination of kool, "cabbage," and sla, "salad" a dish that was known in America in print by 1785. Because it is usually served cold, some call the dish "cold slaw" in contrast to "hot slaw," but there is no relation to the temperature in the etymology''. The Encyclopedia of American Food & Drink, John F. Mariani [Lebhar-Friedman:New York] 1999 (p. 92). The earliest European settlers on North America's eastern shores brought cabbage seeds with them, and cabbage was a general favorite throughout the colonies. The Dutch who founded New Netherland (New York State)...grew cabbage extensively along the Hudson River. They served it in their old-country ways, often as koolsla (shredded cabbage salad). This dish became popular throughout the colonies and survives as coleslaw...By the 1880s, cabbage and its cousins had fallen from favor with the upper class because of the strong sulfurous odors these vegetables give off when cooking...But this sturdy and versatile vegetable never disappeared from middle-class kitchens. Oxford Encyclopedia of Food and Drink in America, Andrew F. Smith [Oxford University Press:New York] 2004, Volume 1 (p. 147) . 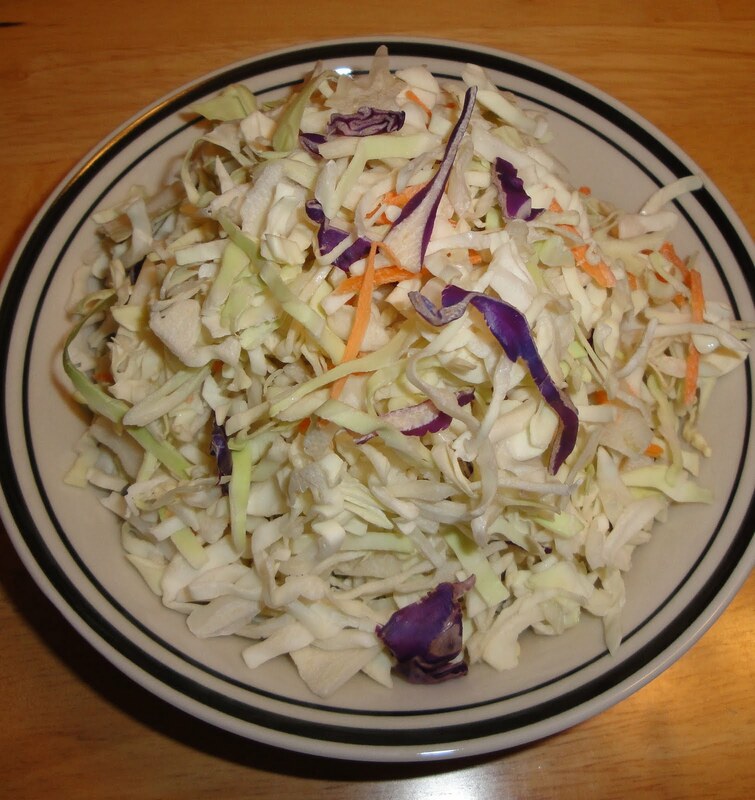 Cool slaw, cabbage salad, has, of course become Ecole slaw; in the nineteenth century housewives who had forgotten, or never known, that cool is Dutch fo "cabbage," were already miscalling the dish "cold slaw," which gave illegitimate birth to "warm slaw''. Eating in America: A History, Waverley Rood & Richard de Rochemont [William Morrow and Company:New York] 1976 (p. 302-3). In a large bowl, toss together coleslaw and parsley. In a small bowl, whisk together remaining ingredients. Add to coleslaw, toss well. Taste and adjust seasoning, if desired. Chill until ready to serve. Enjoy! Coleslaw is such a classic salad to go with a nice burger. Good to know all these info about the origin of this basic salad. I have never made cole slaw. Weird, huh. Every time I buy a bag of slaw mix, it ends up in either a stir fry or a chicken salad. My poor husband loves cole slaw and has to get it from restaurants. Coleslaw is great with grilled meats. Thanks for the very interesting info! Hi Ann, I'm so sorry your first one didn't go thru. I love food history. Thanks so much for stopping by. I've always liked coleslaw, especially on a sandwich. Love all the good information about Coleslaw.... and urs looks lovely. Coleslaw is actually the first salad I've tasted. It is such a classic and loved by many people. I always enjoy reading your blog as it has a lot of useful and interesting information. Thanks for the interesting article Christine.